THIS ITEM IS NOT AVAILABLE AT PRESENT. WE WILL NOT BE GETTING ANYMORE Star Wars Millennium Falcon Mini Vehicle Graphic. From the Star Wars collection by Fanwraps. 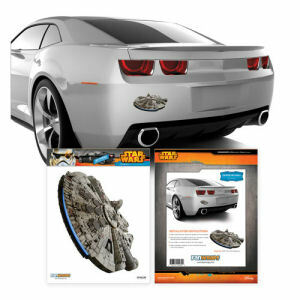 Star Wars Millennium Falcon Mini Vehicle Graphic. Millenium Falcon Graphic measures 7 inches tall by 9 inches wide. After installation the decals can be easily removed but not reapplied. Safe on all automotive paints and finishes.